Who doesn’t want to hang out, drink some coffee and pets some adorable cats? Though those with allergies may steer clear, cat lovers have been flocking to cat cafes since the first one launched in 1998. These too-cute cafes provide all the benefits of feline companionship without any of the actual headaches (you know, the way your cat screams for you to play at 3 a.m. when you’re trying to sleep or the fact that she uses your vintage furniture as a scratching post). Some cat cafes even double as a rescue, helping orphan kittens find loving homes. Though the first cat café launched in Taiwan, they’ve been popping up all over the world ever since. These pawsome cat cafes from around the world will trip your wanderlust faster than your feline friend decides she no longer wants to be pet (which, if you know cats, is probably pretty fast). Cat Flower Garden is often regarded as the first cat café in the world. It’s been around for two decades. Though business wasn’t booming at the start, by 2018 the shop is packed with mostly tourists from Japan and Taiwan. Cat Flower Garden is home to 15 adorable kitties, whose love you can buy with different cat snacks like dried fish. The cats roam as they please, hopping on tables and cuddling up to their new human friends. Though they enjoy their catnaps, food is usually enough to entice them. This cat café in Paris, France doubles as a tearoom and a restaurant – but it has tons of kitties so it’s obviously way better than your average tea joint. Café Des Chats opened in 2013 and was the very first in the La Marias neighborhood (but it’s since moved to La Bastille). The owners adopted their fun-loving kittens from shelters and chose them based on personality – they love people and other felines. 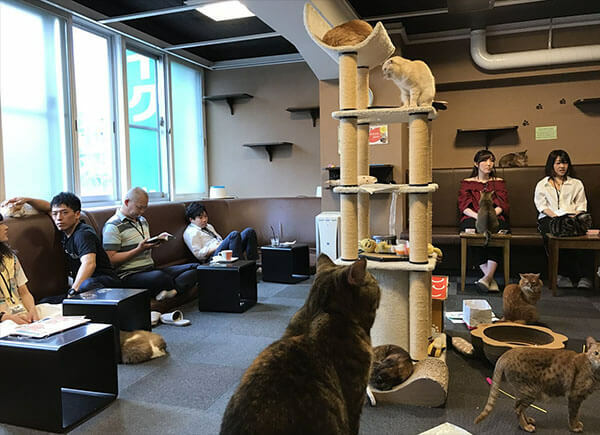 Whether you choose to enjoy a full dinner or just a cappuccino, this cat café recommends going later in the night because cats are totally amped when the sun goes down. Calico Shinjuku is about the closest you can get to hanging out with a kitty at home. The café has TVs and gaming consoles so you can play video games and watch your favorite shows while snuggling up to a precious little feline (basically, it’s a cat lover’s dream). To get cats to cuddle up (instead of ignoring you and going about their business), you can purchase some cat food for about $3 USD. The staff also speaks English for tourists from America and you get a comprehensive guide that shows all the cats and their names. It’s really like you’re making lasting kitten friendships, though they’ll probably forget who you are the second they’ve eaten all your food. Brooklyn Cat Café is the first of its kind in the trendy New York City borough. This café may be in Brooklyn Heights, but the joy doesn’t stop when you leave its doors. In fact, you don’t have to show up at all to enjoy Brooklyn Cat Café’s adorable kittens. The café has a 24-hour cat cam which is basically a live feed of a mother and her kittens (just try to name something cuter). 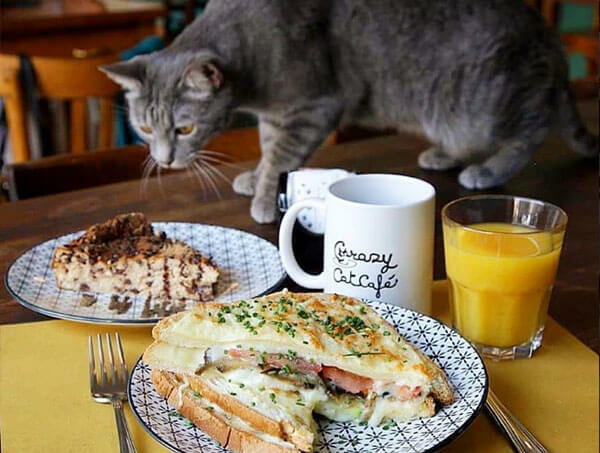 This café is catered towards vegan and vegetarian cat lovers and there are plenty of treats that fit the needs of vegans and meat-eaters alike. Plus, the cats are available for adoption so you don’t have to worry about falling in love and getting your heart broken. Meow Parlour, New York’s first cat café, aims to battle pint-sized apartments by letting those who simply don’t have space for a pet (or aren’t allowed to have a pet) cuddle up to some adorable, free-roaming cats. They’ve got free Wi-Fi and sessions last a half an hour, though you can always stay longer. The café is teamed up with KittyKind, a no-kill rescue group making the effort both fun and meaningful. 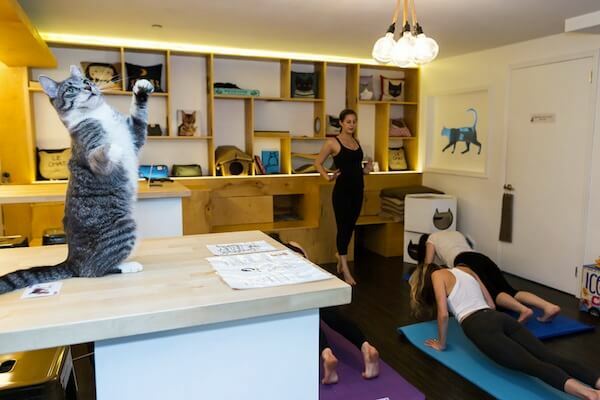 Visitors can adopt any of the 11 cats that roam the café or enjoy some cat yoga (yup, that’s an actual class they offer!). The only downside is that if you want a treat, you’ll have to snag it from Macaron Parlour next door because New York City does not allow food to be served where there are animals. You can take whatever you order at Macaron Parlour into Meow Parlour to enjoy it with the feline company. Neko no Niwa, which is the Japanese translation for Cat Garden, is run with a strict adopt, don’t buy mentality. 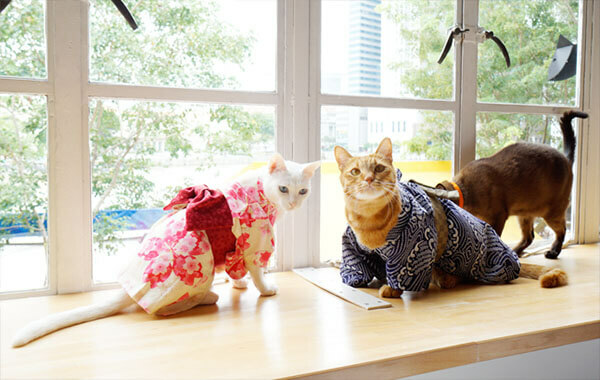 Though many cat cafes across Asia feature pedigree cats, Neko no Niwa is dedicated to saving and loving those that were abandoned. The café has 13 adorable kitties from all walks of life including Kai Kai and Jia Jia, who were rescued from a flooded canal when they were just three months old. Jia Jia apparently “loves toes, fingers, laps, and deserts,” so if you order one of their baked goods, you better watch your back. 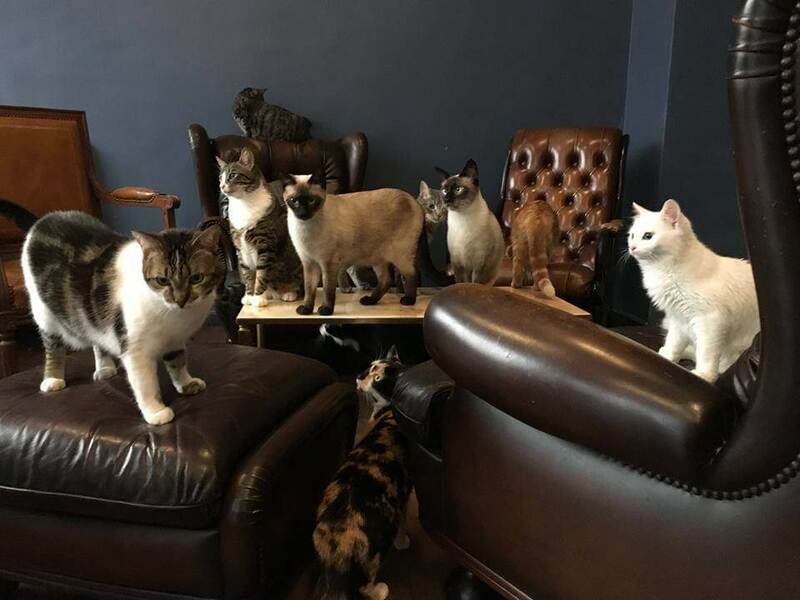 London’s first cat café, Lady Dinah’s Cat Emporium, is undoubtedly the best place to enjoy a traditional cuppa while you’re playing with one of over 15 cats housed in the café. The establishment spans two entire stories and offers traditional British tea sweets like scones with clotted cream and light lunch fair like paninis, soups, and salads. The theme of the place is pure magic – Cat Wonderland. All cats are cute but there’s something so incredibly magical about watching kittens wander through the Alice in Wonderland-themed décor. It’s everything, especially watching cats crawl across pint-sized rope bridges on the ceiling. 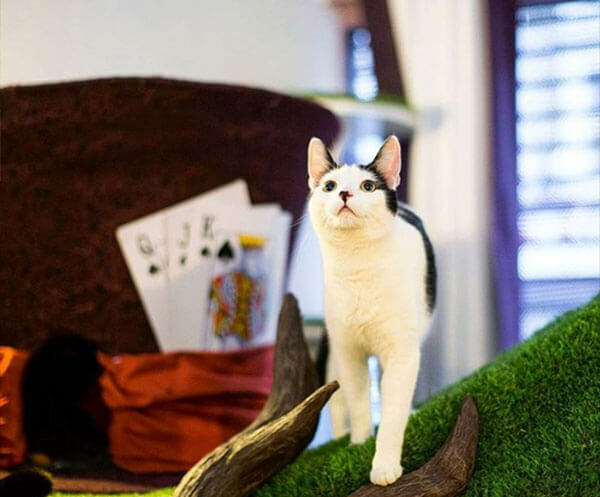 Crazy Cat Café in Milan, Italy has a commitment to the Italian lifestyle. They’ve got two different menus – one for brunch and one for dinner (though you can definitely stop by for an aperitif). The café offers a huge selection of specialty drinks – from shakes to whipped cream and caramel-topped lattes. With options like vegan cheese sandwiches, lush avocado toast, and creamy cheesecake, the food is almost as much of a mainstay as the gaggle of adorable kittens that freely roam the premises. 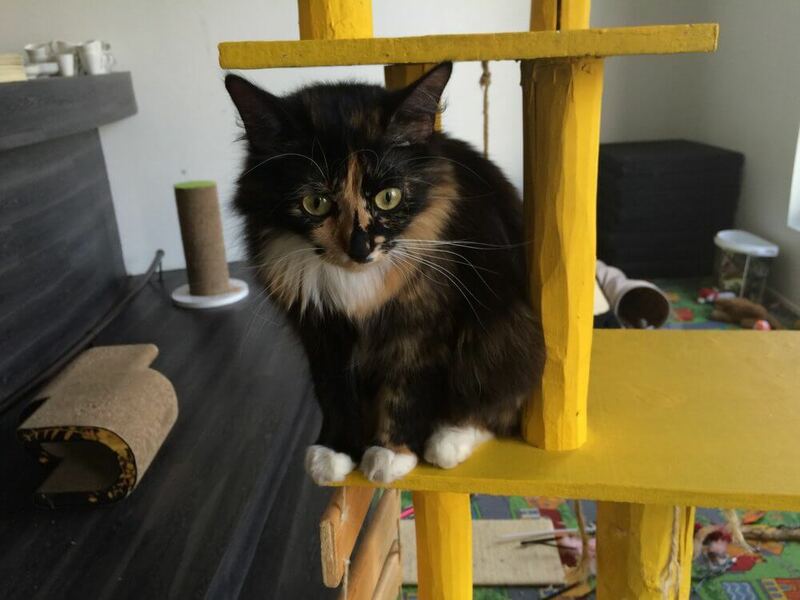 There’s just one problem about Crazy Cat Café – it’s wildly popular (for good reason). Don’t skip out on getting a reservation because there’s a huge chance you’ll be completely shut out. 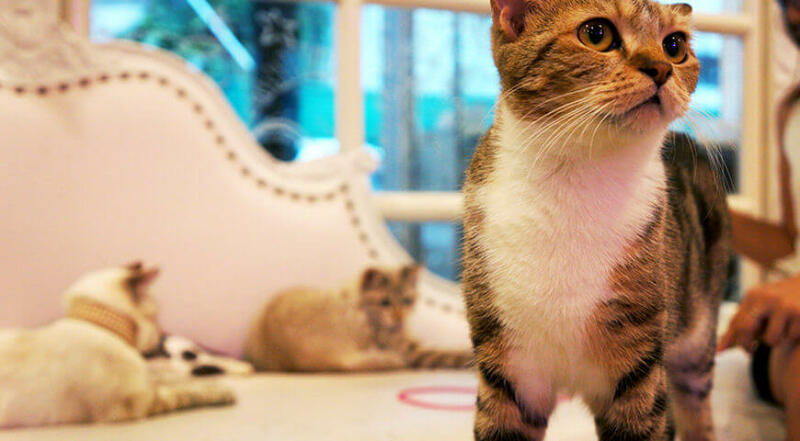 Bangkok’s Caturday Cat Café is widely regarded as the liveliest cat café in Thailand. The cats are very active, so if you’re expecting to just sit among cats, you better look elsewhere. These little guys want to play, and their affinity for people has garnered enough attention to attract a hefty line. If you don’t mind the wait, you’ll be richly rewarded. The café has about 20 cats and floor seating so everyone is on the same level – cats and humans alike! Not to mention, this place is totally Instagram heaven. If the cats don’t do it, the rainbow crepe cake will. Cats and cocktails is the motto at Le Chat Touille in Saint-Gilles, Belgium. While most other cat cafés offer a range of cakes and teas, this one lets you get your booze on with adorable, free-roaming kittens; however, patrons who want skip the alcohol can still enjoy the typical café fare. All the cats in Le Chat Touille have been abandoned by their previous owners, treated by a shelter and are ready to be adopted. Just don’t have too many cocktails and walk away with every cat you see (though the urge is definitely hard to resist). If you venture all the way to Eastern Europe, you’ll have a lot more to explore than grandiose castles and quaint Christmas markets. 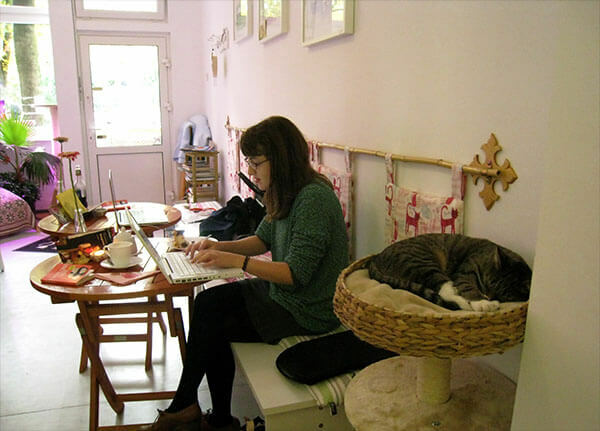 Cat Café Nurri gets their cats from a mix of donations and local animal shelters. All of them are vaccinated, micro-chipped and taken care of to the highest standards. Café Nurri chose their feline friends because they adore humans. You should be prepared to play but also to eat. The café is fully stocked with fair trade coffee and tea, a variety of salads, soups and pasta, and of course, lots of cakes. There’s a small €5 entrance fee tacked onto every bill to support the care of the café’s nine cats. 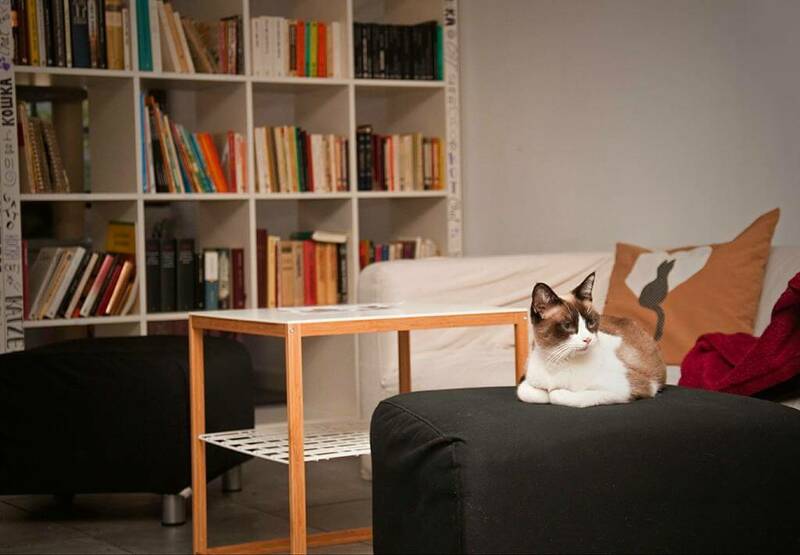 La Gatoteca isn’t just a cat café – it’s the actual headquarters of ABRIGA. The NGO is dedicated to rescuing cats and educating citizens about responsible adoption. 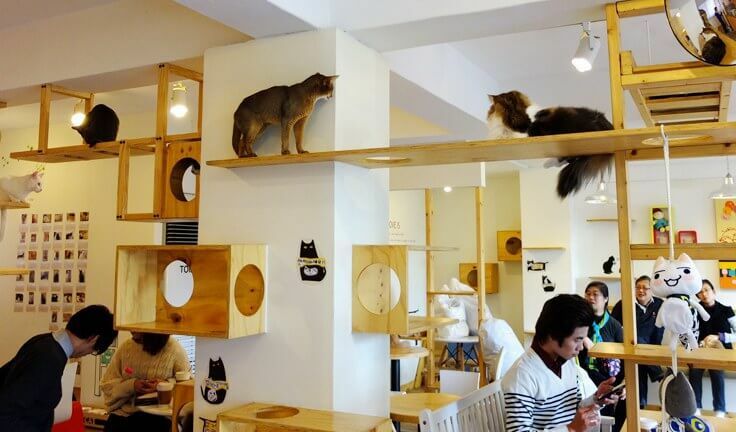 It’s a hybrid cat café and sanctuary, where visitors can adopt a cat while enjoying a relaxing cup of tea. La Gatoteca is located right near the Reina Sofia Museum making it the perfect spot to hang out after browsing the world-renowned work of arts next door – and we’re not the only ones who think so. The café is rated in TripAdvisor’s top ten places to hang out in Madrid (in the Spas & Wellness category). 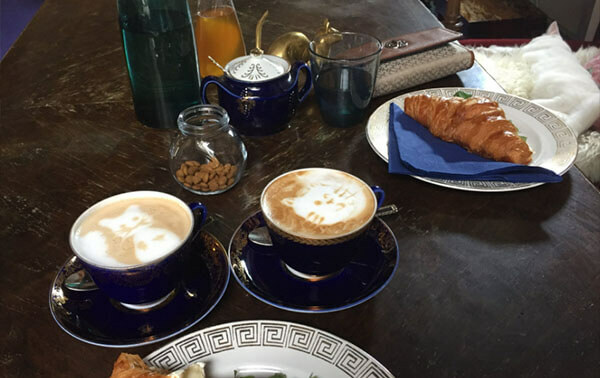 All the details at Kocia Kawiarnia Kociarnia in Krakow, Poland are purr-fectly adorably — from the foam kittens on top of each latte to the cute painted, wooden cat that marks your table. While the cats in the café are perfectly pet-able, the cafe advocates for the species as a whole. They regularly collect items for the local animal shelter, promote adoptions and organize educational meetings for children, the elderly and people with disabilities. Kocia Kawiarnia Kociarnia is also an advocate of the arts. You can participate in art classes or literary nights held at the café. What artist doesn’t want to sketch an adorable feline? This Finland cat café is uniquely cozy – and the seven cats who roam freely definitely don’t mind. Unlike other cat cafés that look like a traditional restaurant, Kissakahvila Purnauskis is furnished like a home. There are sofas, books to read while you hang out and plenty of cats to pet. It’s a total oasis of relaxation. Kissakahvila Purnauskis serves classic café fare (soup, croissants, and bread), but they’ve also got a variety of Finnish specialties from pickles and cheeses to salmon and cloudberry jam. Everything is organic and the drinks are too cute (especially if you’re a fan of cat-themed latte art). Cats Republic finds its way on this list solely because it has sphynx cats. Any sphynx lover will tell you, they’re by far the cutest of all cats and absolutely adore human attention, but they’re always overlooked. Not anymore! St. Petersburg is a beacon of kitty love – they’ve even enlisted a group of cats (dubbed the Hermitage cats) to protect the beloved art collection at the Hermitage Museum from pests. When these fur babies retire, some of them head over to Cats Republic, which takes its name super seriously. At Cats Republic, every visitor must apply for a “visa” (you get it after paying the $7 entry fee) and is led to a cozy, cat-filled room by a “cat ambassador.” You’ve got to meow three times before they let you in. If you’re not into all the smoke and mirrors, there’s a cozy café up front. KitTea is trendy, airy and bright. It’s the perfect place for a dozen rescue kittens to lap up the sunshine and relax. It’s also the perfect place for yoga. 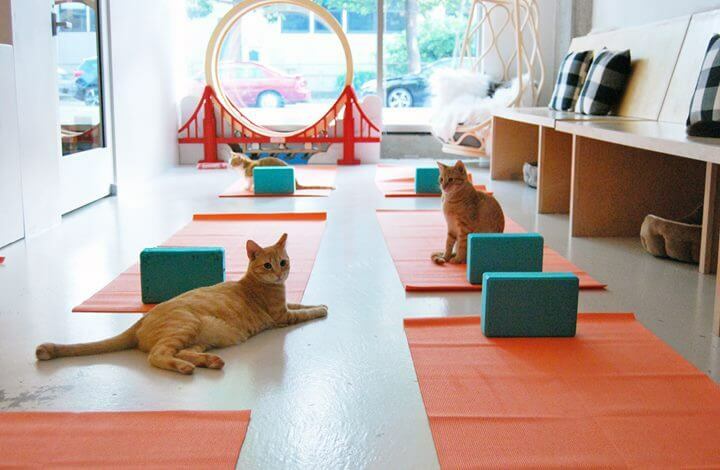 San Francisco’s first cat café has a yoga class every Wednesday. 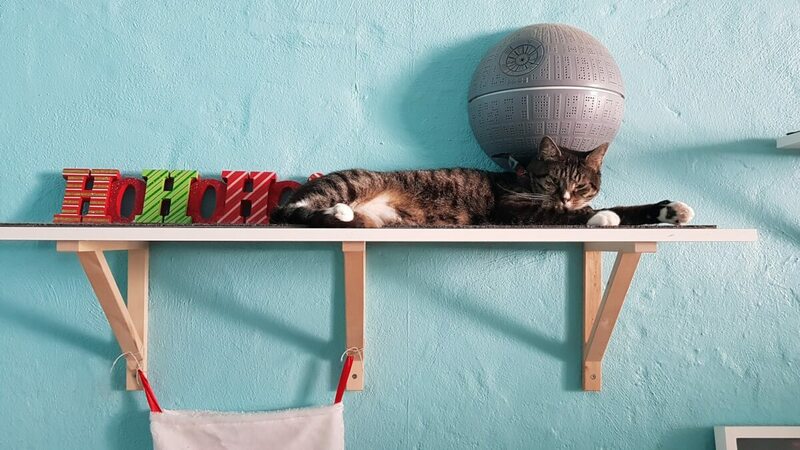 It’s a haven for cat lovers who want to relax – but it also doubles as a super trendy startup. In the heart of the tech industry, KitTea also offers a subscription box (similar to startups like BirchBox). It includes a monthly delivery of cat-themed products like lapel pins, stickers, socks, and accessories. Each month has a theme like “Meowloween,” “Happy Pawlidays” and “Cats as Food” (which we’re honestly dying to see). According to Cat Café Budapest, it’s proven that playing with cats lowers anxiety, high blood pressure, and stress. It’s no surprise that tourists find themselves popping in to get a break from the hustle and bustle of the Budapest’s city center. Cat Café Budapest has 10 different cats with all different temperaments. While most cat owners are privy to a feline’s rough play (and the occasional scratches that come with it), there are some cats newcomers should steer clear from. Other cats are just thrilled to be the presence of a tinfoil ball – how precious? They’re all listed online, so you can see which cats to approach when you show up. 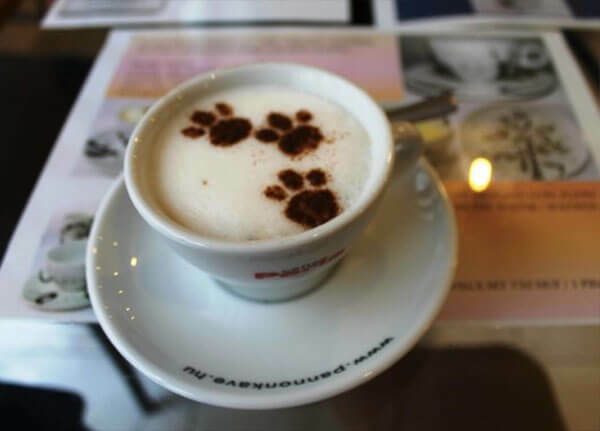 The café is best known for its cat-puccino, a super-rich cappuccino with peanut butter and cinnamon paw prints – yum! Pee Pees Katzencafe is adorable in every sense of the word – from the roses in the center of each table to the cinnamon hearts on your iced latte foam. The café offers a range of homemade cakes and pastries, which is well worth the 20-minute drive from Berlin’s city center. 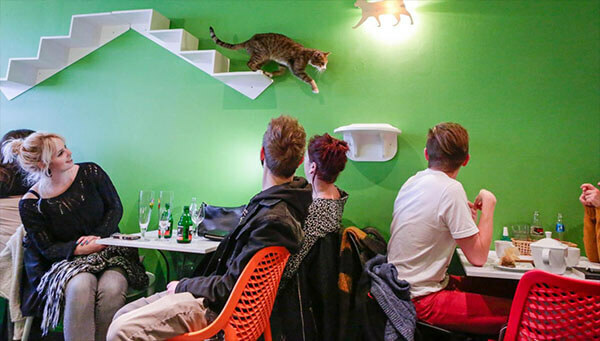 As Berlin’s first cat café, Pee Pees opened its doors in 2003 and is definitely suited for beginners who aren’t looking to drown in a pile of cats. The food is enjoyable and the cats are adorable enough to grab your attention without feeling overwhelming. It’s dining in the presence of a feline like you would at a friend’s house more so than visiting a cat cafe. It’s familiar and relaxing, to put it simply. As if a cat café wasn’t enough of a theme, Catmosphere touts itself as Sydney’s first (and probably only) space-themed cat café. They’ve also got a location in Thailand, and admittedly, the space theme is a little weird, but you have to give props for adding more kitsch on top of an already wildly kitschy restaurant. Catmosphere has about 10 to 14 adult catstronauts that roam the premises and most are available for adoption. The company works with the rescue groups World League for Protection of Animals and Kitten University to give a safe space to cats that don’t fit in the shelter. They’ve also got one key feature most cat cafes are lacking – you can rent two hours in their cat cinema and enjoy a sci-fi flick with some popcorn and a kitty. If you’re already exploring the trendy, arts-centered city of Edinburgh, Scotland, there’s no reason not to pop into Maison de Moggy for a traditional Scottish tea. This cat café is Scotland’s first and is based on the popular Japanese concept except their focus is on rare-breed cats. 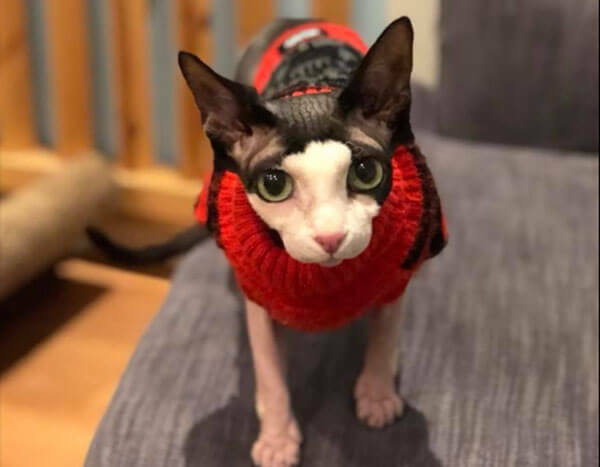 They’re the only cat café in Europe with a sphynx (and she’s got some adorable spots and a few killer outfits). If that’s enough to sway you, the freshly made cakes and cupcakes are all sourced locally (with vegan options!) and they’ve even got ice cream during the summer.